The comfortable lounges and the Bistro Kitchen are always available for social time, morning coffee or afternoon tea. Our chef provides delicious meal selections that honour ethnic diversity and festive occasions, including a traditional Sunday dinner. Our elegant private dining room may be reserved for celebratory family gatherings. The Multi-purpose Recreation Room is the perfect venue for live entertainment, movies, plays and special events. 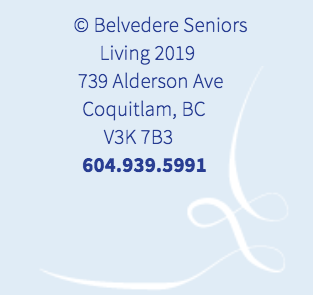 Living at Residences at Belvedere is an exceptional and supportive housing experience. for more information or to reserve a place in our community today!